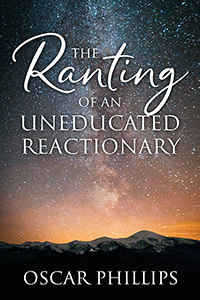 Oscar J. Phillips’s “The Rantings of an Uneducated Reactionary.” These days, there is no such thing as politics as usual. So Americans who care about the future of this country need books on politics that don’t pull any punches. This book comes out swinging and doesn’t stop till the last page. Using humor and curve balls to keep readers on their toes, these political, ideological, and philosophical essays are like nothing readers have ever seen before. Next Next post: Put the Spook Back in Halloween With This One-Day Flash Sale!